This means: do not put yourself at the forefront of the interaction after shaking hands with a woman you’ve met. Instead, focus on the person you’re speaking with, what her needs are and how she would interact with your contacts. Imagine YOU, someone she might consult, perhaps to resolve tension with her landlord. Consider YOU, the person to whom this woman might, for example, provide bookkeeping services. Seat yourself at the hub of a wheel of professionals and specialists. In your travels, you collect information about those you meet. Then, you’re able to make recommendations and introductions. Do this selflessly, without considering the personal benefit you might derive from that initial or subsequent interaction. Be seen as a connector/Recruit resources: A client recently asked if I knew someone who might conduct market research for his business. Yes, I do. I know five market research professionals. Two spoke with me and were very interested in the project. Make introductions: If you know a networking contact is open to meeting a potential client or a potential resource, use your smartphone and dash off an email introducing the pair to each other on the spot. Maintain contacts: I know Michael will attend a certain monthly group. We don’t have to email or speak in between events. We catch up in person. Learn from the speaker: The presenter stands at the podium because she has specific and timely insights to share with others in the industry or the professional group. Listen up. Stay up to date informally: A colleague has a new job. A company is expanding locally or nationally. There’s talk about a competitor losing market share. You’ll hear it through the grapevine. Use your antennae. Be seen as in the know: Everyone wants to associate with insiders who have their finger on the pulse of the market. You can be that person. All of these motivations speak to the mantra of keeping YOU (and not ME) at the center of your networking conversations. Now, do I hope to meet prospective clients at networking events? YES. Would I like to receive introductions and referrals? Absolutely. These are not my primary objectives, however. Getting referrals and meeting prospects are more likely to happen in follow-up activities outside the networking event, after others see you as knowledgeable and trustworthy. Serving as a resource establishes that expertise and builds that trust. Attend two meetings of this group before you decide to join. Meet two people at each event. Do you listen to WII-FM, the world’s greatest radio station, also known as What’s In It For Me? Perhaps it’s time to switch channels. Contact me at 212-677-5770 or janet@janetlfalk.com and we’ll find some new networking groups where you can become involved and promote your role as a connector and resource. 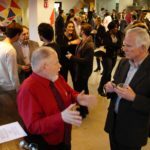 This is the first in a series of three newsletters about Networking. The second will discuss pre-event marketing and the third will discuss get-to-know-you problem and solution questions that engage networking contacts. Thanks to Tiffany Ashitey and Tasha Morris of The Benchmark Creative Group. Their invitation to speak at Brooklyn Marketing Week was the impetus to crystallize my approach to networking. PS Did you see my quote in The Wall Street Journal? If I can get myself in that most-desired publication, imagine what I might do for you, your clients and your contacts. This entry was posted in Marketing, Newsletters on November 6, 2017 by Janet L. Falk.